This article is for anyone who wants to start developing Virtual Reality projects in UNIGINE and is highly recommended for all new users. We're going to look into the VR Sample demo to see what's inside and learn how to use it to create our own project for VR. We're also going to consider some simple examples of making modifications and extending the basic functionality of this sample. Thinking about VR developers we created the VR Sample demo enabling you to jump straight in and start creating projects of your own. It supports Oculus Rift, HTC Vive and Vive Pro out-of-the-box. We recommend to use this demo as a basis for your VR project. 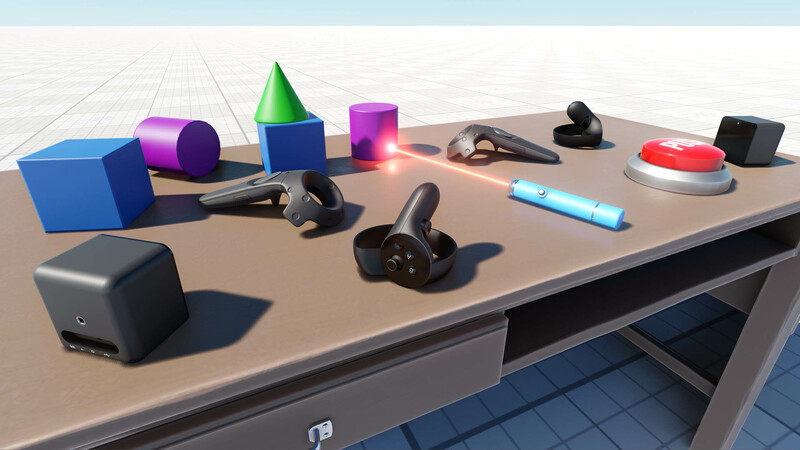 Here you'll find a set of 3D models of all popular VR controllers, as well as implementation of basic mechanics such as grabbing and trowing objects, pressing buttons, opening/closing drawers and a lot more. The world in this sample project has its settings optimized for best performance in VR and includes a .render asset that can be loaded at any time by simply double-clicking on it in the Asset Browser to reset any changes you made to default optimized values. The sample project is created using the Component System, so the functionality of each object is determined by the components attached. So, ok we have a cool demo with some stuff inside, but how do we use it as a template? 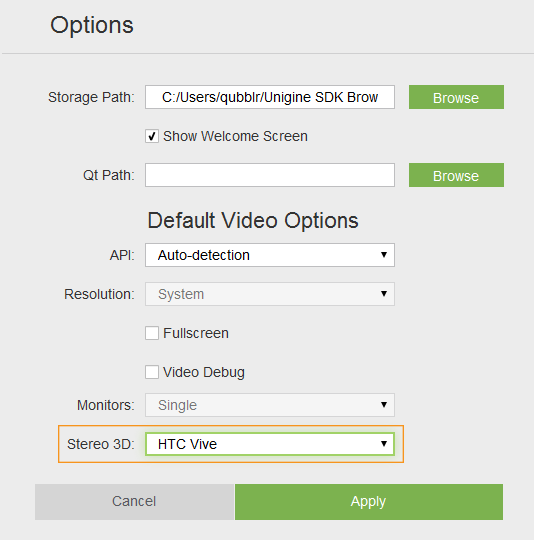 It's simple - just open your SDK Browser go to the Samples tab and select Demos. 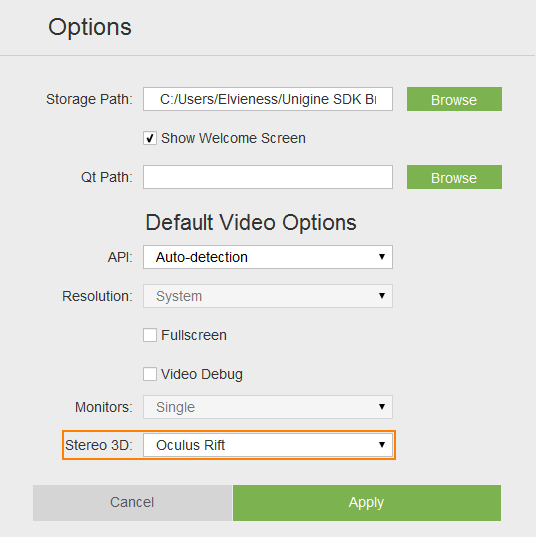 Find the VR Sample in the Available section and click Install. After installation the demo will appear in the Installed section, and you can click Copy as Project to create a project based on this sample. 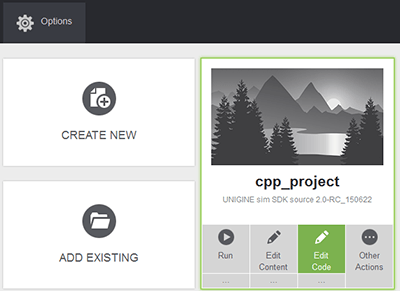 In the Create New Project window, that opens, enter the name for your new VR project in the corresponding field and click Create New Project. Suppose you have successfully installed your Head-Mounted Display (HMD) of choice (please visit Oculus Rift Setup or HTC Vive Setup in case you did not). In case you are having difficulties getting your HTC Vive to work, this Troubleshooting guide might be helpful. Major VR devices are supported out-of-the-box so the only thing you should do is to make sure that the correct plugin is loaded for your HMD. You can also specify the plugin to be loaded for your application via the Customize Run Options. 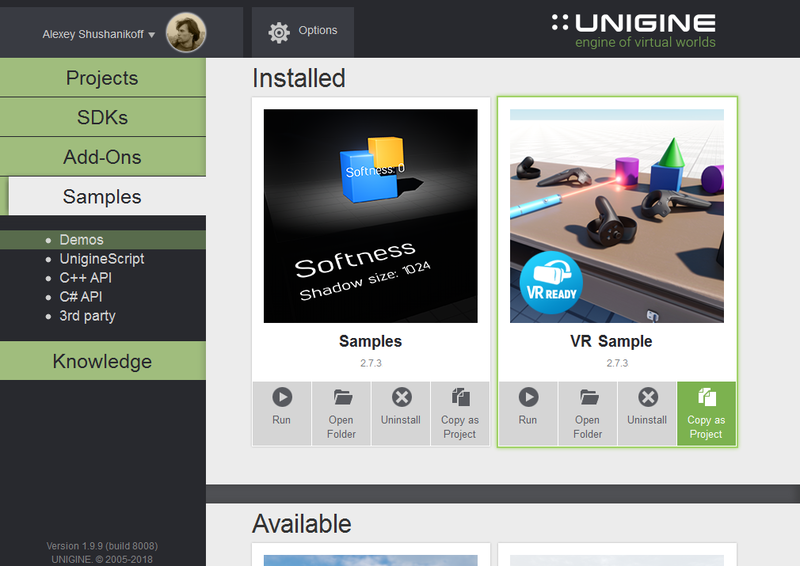 To open your VR project in an IDE select it on the Projects tab of the UNIGINE SDK Browser and click Edit Code. As the IDE opens, you can see, that the project contains a lot of different classes. This brief overview will give you a hint on what are they all about. Don't forget to set the appropriate platform and configuration settings for your project before compiling your code in Visual Studio. Now, we can try and build our application for the first time. 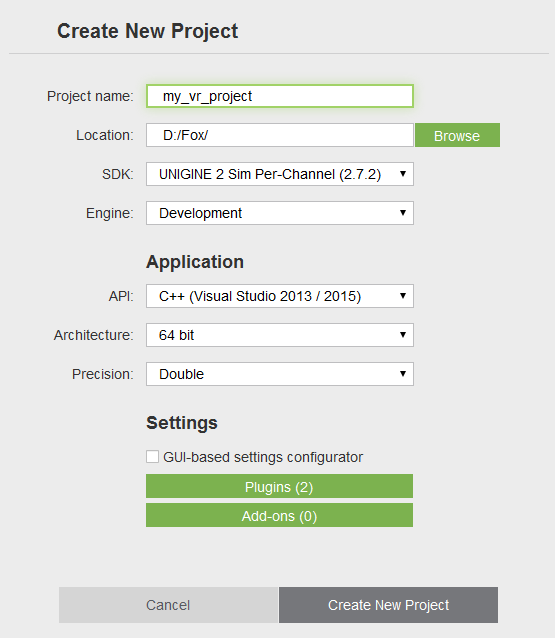 Build your application in Visual Studio (BUILD -> Build Solution) or otherwise, and launch it by selecting the project on the Projects tab of the UNIGINE SDK Browser and clicking Run. 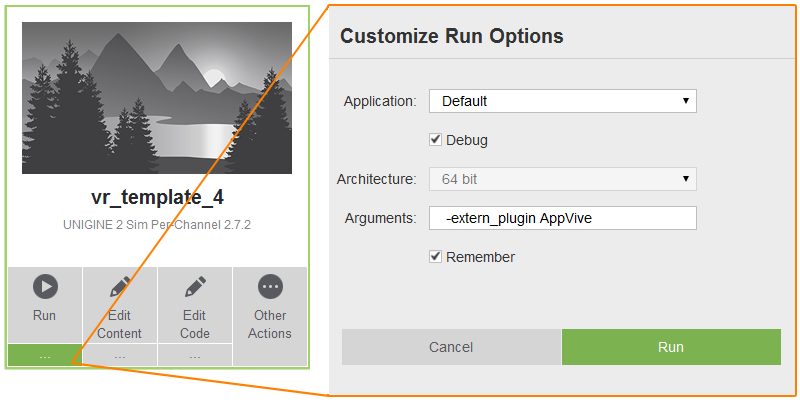 Before running your application via the UNIGINE SDK Browser make sure, that appropriate Customize Run Options (Debug version and x64 architecture in our case) are selected, by clicking an ellipsis under the Run button. Sometimes it might be necessary to attach some object to the HMD to follow it (e.g. a hat). All movable objects (having the movable.prop property assigned) have a switch enabling this option. For example, if you want to make a cylinder on the table attachable to the HMD, just select the corresponding node named "cylinder" in the World Hierarchy click Edit in the Reference section and enable the Can Attach to Head option. Then select the parent node reference, and click Apply. Suppose we want to extend the functionality of the laser pointer in our project, that we can grab, trow and use (turn on) for now, by adding an alternative use action (change material of the object being pointed at, when certain button is pressed). So, we're going to add a new altUseIt() method to the VRInteractable class for this new action and map it to the state of a certain controller button. In your VR Application you might want to display hands instead of standard controllers included in the sample (e.g. for HTC Vive). Select VR -> spawn_point (a Dummy Player node with the VRPlayerSpawner component) in the World Hierarchy window and go the the Node Properties section in the Parameters window. Basic VR Player settings (the look of controllers and teleport points, teleport ray color, hand force multiplier for physical interactions, spawn point location, etc.) can be customized via the VRPlayerSpawner component or the fields of corresponding vr_player_spawner.prop property. Drag the desired node for each hand from the World Hierarchy window or Scene Viewport to the corresponding field of the vr_player_spawner.prop property. 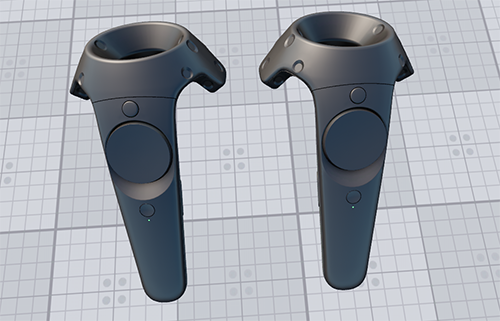 For example, we can make Vive controllers look like Oculus Touch by dragging oculus_touch_left and oculus_touch_right nodes to Vive Left Controller and Vive Right Controller fields respectively. Save the world and launch your VR application, your Vive controllers will look like Oculus Touch in VR. This code should be executed before the VR Player is spawned. So, it should be put to the AppWorldLogic::init(). The next step in extending the functionality of our VR Sample is adding a new interactable object. Let's add a new type of interactable object, that we can grab, hold and throw with an additional feature: object will change its form (to a certain preset) when we grab it, and restore it back, when we release it. It will also display certain text in the console, if the corresponding option is enabled. Build your application and launch it as we did earlier, a new property file (transformer.prop) will be generated for our new component. Open the world in the UnigineEditor, create a new box primitive (Create -> Primitive -> Box), and place it somwhere near the table, create a sphere primitive (Create -> Primitive -> Box) to be used for transformation. To add components to the box object select it and click Add New Property in the Node Properties section, then drag the movable.prop property to the new empty field that appears. Repeat the same for the transformer.prop property, and drag the sphere from the World Hierarchy window to the Target Object field. Save your world and close the UnigineEditor. Try to analyse the source code of the sample further and figure out how it works, use it to write your own. Read the Virtual Reality Best Practices article for more information and useful tips on preparing content for VR and making user experience better. Read the Component System article for more information on working with the Component System. Check out the Custom Component System Usage Example for more details on implementing logic using the Custom Component System. You can select the VR project template when creating a new application via the SDK Browser to create an empty VR application from scratch (having demo content and code stripped off).